There’s a different breed of killer out there. They aren’t driven by the need to drink blood or the pulse of the full moon. They kill because they have to, because murder is the only thing they know. Will you hunt the slashers — or join their ranks? • A grim exploration of the slasher phenomenon: why are some humans—including some hunters—driven to kill? How can some of them shrug off bullets or ignore an axe to the skull? • A look at a new hunter conspiracy driven to investigate, hunt—and hopefully arrest—supernatural serial killers: the FBI’s VASCU, or Vanguard Serial Crimes Unit. • Learn how to use slashers in a story both as antagonists and as anti-hero protagonists. Examine the cruel Undertakings of the slashers of the World of Darkness. 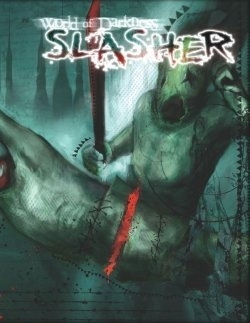 • New weapons in the fight against slashers… as well as new slashers in the fight against everybody with a pulse. Includes new equipment, Tactics, Merits, and Endowments (including VASCU’s psychic Teleinformatics abilities). This title was added to our catalog on February 04, 2009.